As the P5+1 negotiations with Iran continue, there are grounds for optimism that an agreement can be reached by the July 20th deadline. A deal would be a significant achievement in the ongoing battle against the proliferation of nuclear weapons. But this raises the question: what about the rest of the world’s nuclear weapons? First, the good news. The nuclear tide has been on its way out. There are now an estimated 17,000 nuclear weapons held by nine countries, down from a Cold War high of some 65,000 weapons. Nuclear weapons are complex systems that a lot of people handle in a lot of places creating many opportunities for disaster. Over the past decades there have been truly frightening incidents. 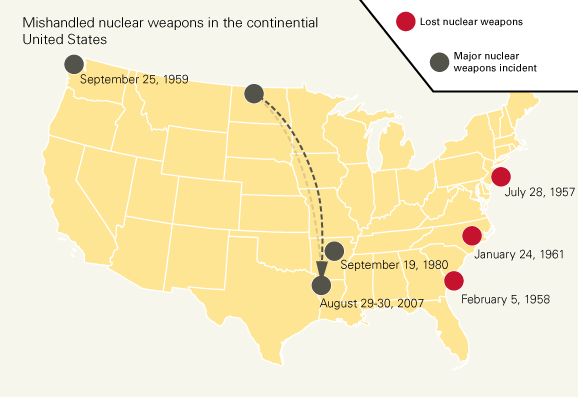 These include nuclear-armed bombers crashing in Greenland and Spain; a nuclear missile catching fire in Arkansas; and a nuclear bomb fell off a plane off the coast of Georgia. It’s still there and nobody knows where. Eric Schlosser’s book Command and Control gives many other chilling examples. Nuclear know-how has spread to unstable countries already locked in bitter rivalries. With tensions simmering, regional strongmen have calculated they need nuclear weapons to guarantee their grip on power. Far from providing security, these weapons have made existing conflicts much more dangerous. A highly paranoid North Korea perceives nuclear weapons as the trump card that will ensure its survival. The country regularly threatens the United States and South Korea with total annihilation in particularly alarming language. Given its erratic, aggressive behavior and the fact they possess roughly 10 nuclear weapons, it’s hard to dismiss these as empty threats. With tensions so high on the Korean peninsula, even a slight miscalculation could set off a chain of events culminating in nuclear consequences. India and Pakistan have been at daggers drawn since they split into two countries in 1947. They fought their first war within a year and three wars later, tensions still simmer. Given the deep distrust, another war would not be surprising, but this time they both would be nuclear armed. And Pakistan has strongly implied that it is willing to use nuclear weapons in a conflict with India. Aside from a shocking number of deaths, a regional nuclear war between these foes would have global consequences for the world’s food supply as crop yields plummet, including in North America. Even without a regional war, Pakistan’s nuclear arsenal poses a tremendous challenge to global security. Pakistan is beset by serious problems: a weak civilian government, a crumbling economy and exceptionally determined terrorist groups waging war on the state. If the country collapses or an insurgent attack yields a nuclear weapon, a truly nightmarish scenario could unfold. In a post 9/11 world nuclear terrorism is perhaps one of the most pressing issues in global security. Terrorist groups, notably al-Qaeda, have declared their desire to acquire nuclear weapons, going so far as to say it is a religious duty to do so. It’s hard to imagine they would not use them if given the opportunity. The ageing nuclear arsenals of the United States and Russia have reached a critical juncture where, if we don’t destroy them, we will start to refurbish and rebuild the Cold War infrastructure at the cost of hundreds of billions of dollars. These are unusable weapons that drain money and resources from the post-9/11 national security threats. Unfortunately, the two countries are showing little sign of retiring these weapons. Entrenched Cold War thinking and vested political/economic interests mean the two countries are likely to keep these unusable weapons in service for decades more. Does all this sound alarmist or negative at a time when negotiators are edging closer to a historic agreement with Iran? Not one bit. While a deal would be something to celebrate, it is but one piece to a complex, dangerous and continuously evolving puzzle. And this nuclear tide needs to be rolled back. So what can be done? A lot. The time is right to focus our efforts on governments (including the United States) to persuade them that spending so much money on unnecessary weapons is not in their interest nor do they make their countries more secure. How to do that? Well, that’s for Part II of Rolling Back the Nuclear Weapons Tide. Stay tuned.